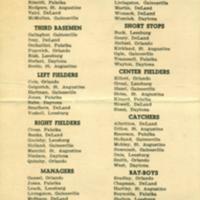 This ballot is from the Florida State League with the purpose of selecting an all-start team to meet the Sanford team at the leagues's celebration of the 100th anniversary of baseballThe instructions are to vote for one man for each position, plus two right-handers, two left-handers, one manager, and one batboy. There is a maximum of 14 persons that one is allowed to vote for. Original ballot by the Florida State League: "The Florida State League Invites you to Help Select the All-Star Team that Meets Sanford in Sanford, Friday, July 14, as the League Celebrates the 100th Anniversary of Baseball. ": Baseball Exhibit, Sanford Museum, Sanford, Florida. Digital reproduction of original ballot by the Florida State League: "The Florida State League Invites you to Help Select the All-Star Team that Meets Sanford in Sanford, Friday, July 14, as the League Celebrates the 100th Anniversary of Baseball." Originally created and owned by the Florida State League. THE FLORIDA STATE LEAGUE INVITES YOU TO HELP SELECT THE ALL-STAR TEAM THAT MEETS SANFORD IN SANFORD, FRIDAY, JULY 14, AS THE LEAGUE CELEBRATES THE 100TH ANNIVERSARY OF BASEBALL. To vote for your ALL-STARS, simply draw a line through the name of your choice. Vote for one man for each position, plus two right-handers, two left-handers, one manager, and one bat boy. Florida State League. “The Florida State League All-Stars Ballot.” RICHES of Central Florida accessed April 20, 2019, https://richesmi.cah.ucf.edu/omeka/items/show/431.